The Visalia Rawhide and the California League announced today that Visalia Rawhide RHP Jose Almonte has been named a California League Postseason All Star and Pitching Coach Jeff Bajenaru has been named the California League Coach of the Year. 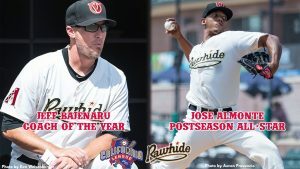 Almonte, who is currently 9-8 with a 3.63 ERA, has earned his second career All-Star nod after being named a Cal League Mid-Season All-Star this summer. Originally signed by the Boston Red Sox, Almonte was sent to the Diamondbacks along with 2B Luis Alejandro Basabe in the July 9, 2016 trade that sent RHP Brad Zeigler to the Boston. This season, Almonte leads the league in strikeouts per nine innings among starters (10.47), is two wins shy of the league lead (9), is fourth in ERA, second in strikeouts (147), and third in batting average against among starters (.245). Almonte set a career-high when he struck out 11 against Lake Elsinore on May 27, and has twice this season won three consecutive starts. Almonte is 21-23 with a 3-36 ERA and 391 strikeouts in his five-year Minor League career. He was ranked as the 18th-best prospect in the Arizona farm system this year by Baseball America and was ranked as the number-27 prospect in the Diamondbacks system by MLB Pipeline in their midseason update. Almonte is the lone representative Visalia representative on the California League Postseason roster after the Rawhide had one representative in 2016 (3B Marty Herum) and two in 2015 (LHP Anthony Banda and 2B Jamie Westbrook). Bajenaru’s accolade marks the first time that he has won the California League Coach of the Year award. Bajenaru, who is in his second season with Visalia and his seventh in the Diamondbacks organization overall, has helped to guide the Rawhide pitching staff to a remarkable season. Visalia leads the California League in ERA (3.70), strikeouts (1,198), and WHIP (1.29), has allowed the fewest hits, and has hurled eight shutouts this season, two behind Stockton’s 10. Bajenaru was a 36th round selection by the Chicago White Sox in the 1999 draft and made Major Leauge appearances with the White Sox in 2004 and 2005, and came up briefly with Arizona in 2006. He becomes the first Rawhide coach to be named California League Coach of the Year since Gil Heredia in 2015 and is just the second Visalia coach to earn the distinction since 2010. James Templeton was also named the California League Groundskeeper of the Year, becoming the first ever Visalia Groundskeeper to claim the award after the Rawhide and city of Visalia installed a new playing surface prior to the 2017 season. California League Postseason All-Stars are determined by votes from California League field managers, coaches, general managers, radio broadcasters, and media members. For tickets and more information on the remainder of the Visalia Rawhide’s home schedule, please visit rawhidebaseball.com or call 559-732-4433. You can follow the Rawhide on Twitter (@VisaliaRawhide), Facebook (TheRawhide), Instagram (@visaliarawhide) and Snap Chat (visaliarawhide).